Icy mud oozes between my toes as I march into the lake, leaving my doubts on the sandy shore. As the frigid water reaches my waist I take a moment to admire the shimmering particles of sediment that dance around my legs, as if inviting me to join them in a giant snowglobe. Suddenly I submerge the rest of my body, involuntarily gasping at the shock, and start swimming towards my prey, a fuzzy patch of green at the center of the lake. Once my body settles into the rhythm of motion the shock fades and the beach slowly shrinks behind me. I focus on keeping the Styrofoam cooler of equipment bobbing along in front of me until it finally bumps into what looks like a colony of giant green straws poking out of the water. As I catch my breath several of the oversized straws in my fist make loud popping noises and bend over, as if bowing deeply at the end of their performance. Although I’m six feet tall the water is deep and it takes several minutes for me to find a place to stand. My eventual foothold is the rhizome of Eleocharis sphacelata, a sedge whose Māori name is kuta or paopao (referring to the loud noise that the hollow culms make when burst). This rhizome, although thick, is slippery and springy, so my movements make the entire colony sway and rock, as if the colony is not attached to the lake bed at all but really just a large floating raft. I have come to this tiny island to study how climate change is impacting humans. This plant, kuta, is extremely prized by Māori in New Zealand for weaving culturally important objects, including tāpou (sleeping mats), kākahu (cloaks), tukutuku (wall panels), maro (aprons), potae tauā (mourning headdresses), potae (hats), and kete (bags). Ecologically, kuta is unique because it can grow in water as deep as 3 meters (9 feet)! This exceptional growth habit makes kuta critical to wetland food webs, community structure, and primary productivity. These biological functions of kuta also have commercial applications, such as wetland restoration or remediation of contaminated areas. First, I designed a survey to collect information about how weavers are using kuta. For example, how many people are weaving with kuta? Where do they prefer to collect kuta? Which culms do they prefer to harvest? What times of year do they collect kuta? Knowing more about the weavers and what they value in kuta will inspire conservation strategies that best support the tradition of kuta weaving. Second, I’m using computer models to predict how the location of kuta may shift as environmental conditions change. To do this I used herbarium records to compile a list of where kuta grows or has grown in the past, including some records from the Captain Cook expedition! Computer models analyze each of these locations and calculate what climate factors they have in common. Next, climate change projections are used to map where these ideal conditions for kuta will be in 50 or 70 years. Combined with the results of the weaver survey, these maps will allow us to estimate how far weavers may have to travel to collect kuta in the future. Third, I’m measuring how physical traits of kuta (including height, diameter, and dry weight) vary based on ecological conditions. These traits have been selected to capture the qualities that weavers value, based on the results of the weaver survey, and will be used to calculate how the changing climate may influence how kuta can be used for weaving in the future. Once analyzed, these data will allow me to recommend strategies for habitat protection in New Zealand that will allow preserve the biological diversity of kuta while also maintaining the rich cultural diversity of Māori weaving. 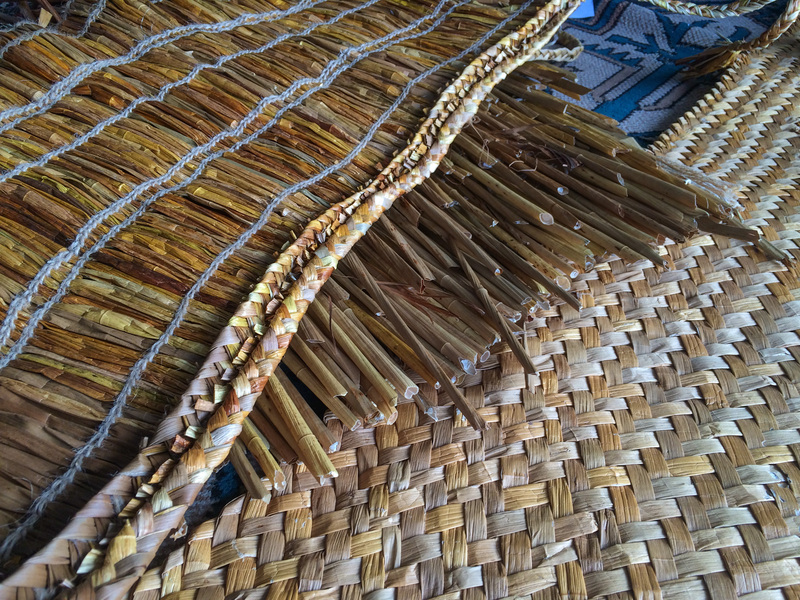 Although this project is based in New Zealand, weaving is critical for many cultures across the planet. Kuta is native to several nations across the South Pacific and related to plants that are commonly used elsewhere in the Pacific (including Hawai‘i, where I live) and/or from similar threatened habitats. Therefore, this study of kuta will yield many insights into cultural resource use, threats, and potential solutions that can be applied to problems elsewhere in the Pacific. Speaking of problems, July is winter in the southern hemisphere and I’m still up to my neck in water! After measuring the culms and collecting plant and water samples I start to pack up my equipment, already dreaming of the towels and tea waiting for me on shore. My reverie is rudely interrupted when I realize that I have forgotten to take a sediment sample. Gritting my teeth, I take a gulp of air and dive into the water, using the culms to pull myself deeper while poking around the rhizomes for a hint of silt or mud. My first several attempts fail utterly and at each return the interwoven rhizomes seem more and more like prison bars. Finally, I erupt from the murky depths and triumphantly plop a fist-sized blob of sludge into my specimen bag. Now, all I have to do is haul everything back those small figures on the distant shore. Who says botany can’t be an Olympic event? The story first published in the Fall 2016 issue of Plants and People, the Newsletter of the Society for Economic Botany. Find it here. Acknowledgment: This project was developed in collaboration with Landcare Research and Te Roopu Raranga Whatu o Aotearoa (the New Zealand National Weavers Collective). This project was funded by National Science Foundation’s EAPSI (East Asia and Pacific Summer Institutes for U.S. Graduate Students) Program and the Royal Society of New Zealand. Special thanks to my collaborators: Te Hemo Ata Henare, Priscilla Wehi, and Barbara Anderson, as well as the weavers who generously assisted us.